Here are the top eight truck safety features that you can add to your TMA trucks to make your operations as safe and successful as they can be. The most obvious truck safety feature on your TMA truck is the attenuator itself. There are several things you need to be aware of though to ensure that your attenuator is as safe as possible. To ensure that the attenuator on your truck performs effectively, you need to ensure that it is tested and rated to withstand the expected speed of traffic. Two common speed ratings are 45 miles per hour and 62.5 miles per hour. Depending on where you are planning to operate, one option is more effective than the other. Beginning on January 1st, 2020, “for contracts on the National Highway System with a letting date after the dates below, only safety hardware evaluated using the 2016 edition of MASH criteria will be allowed for new permanent installations and full replacements.”. AASHTO’s MASH, which stands for the Manual for Assessing Safety Hardware, is testing to ensure that the attenuator is built to withstand crashes effectively. To see a complete list of all MASH tested and approved attenuators, visit this link to see an updated list of all compliant attenuators. To learn more about MASH testing for truck mounted attenuators, read more here. 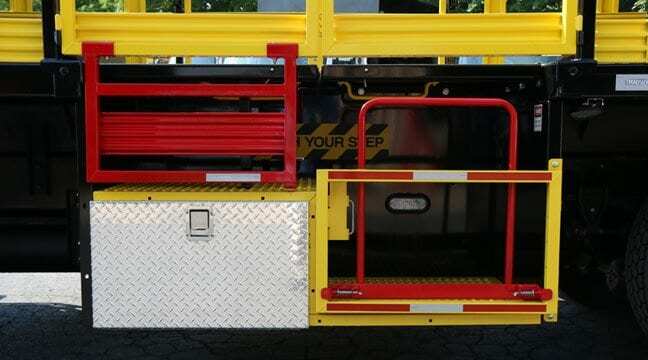 If your TMA truck has man buckets, the next truck safety feature to look for are adjustable safety bars. In the past, safety bars, which are equipped to keep the worker safely in the bucket, were stationary in height. This means that, depending on the operating worker’s height, the bar would be more effective in protecting some workers than others. If the safety bar is not adjustable, and remains permanently at one height, for it to sit at waist-level of one individual would mean it would be sitting much lower on a taller individual. If the safety bar sits too low, it does not do its job in preventing a worker inside the man basket from falling out during a mobile operation. As its name suggests, an adjustable safety bar is built to adjust in height to uniquely protect each worker in it. Whether the worker is tall or short, the safety bar can be quickly moved to protect each individual properly. The full matrix message board can be used in two different manners: as a radar board and as a fully customizable message board. Being used as a radar board, a full matrix message board on your TMA truck gives you the ability to display the posted speed limit as well as the speed of oncoming traffic. Did you know that speeding was a factor in 172 fatal crashes in work zones in 2014? That is 28% of all the crashes that year! In a work zone, a reduction in the speed of traffic equates to a safer work environment for the work crew in the zone. Just how effective is a radar board in slowing down traffic in a work zone, though? 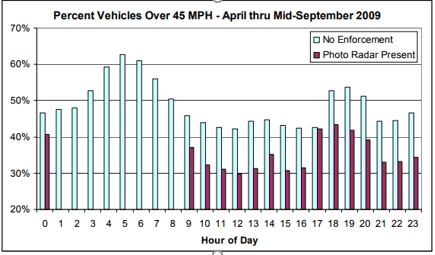 From the study, same hour comparison of percent of traffic that was speeding with and without a radar board present. As you can see, the presence of a radar board drastically reduced speed in the work zone, ultimately contributing in making the area a safer work environment. In terms of being a truck safety feature, a full matrix message board can also do so much more for your work zone in addition to slowing down traffic. The board can display custom messages and images, such as an arrow or chevron, meaning that you can customize the message displayed to uniquely suit your operation’s needs. Creating your own display for the message board is as easy as uploading it to the board from a program on your computer or an application on your phone. 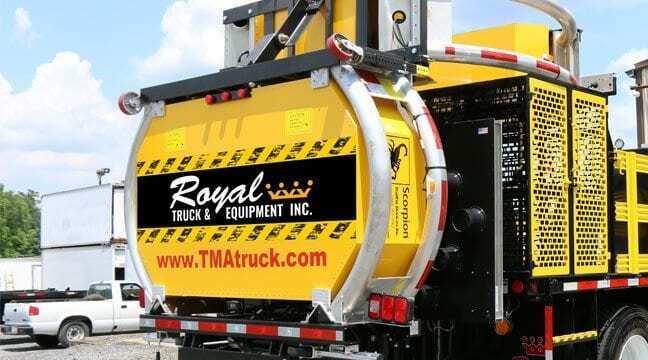 Learn more about the full matrix message board in a recent episode of TMA Trucks A to Z where we go into depth about how to use the board and even speak to the manufacturers of it. When using this feature though, you must be aware of your state’s regulations regarding what can or cannot be display on the board in certain situations. For example, in Massachusetts, “All messages displayed shall be approved by the Engineer prior to being displayed.” Alternatively, South Carolina regulates exactly what must be said in each scenario in a work zone. For example, when operations are in the right lane, “When used in association with a mobile operation, the truck mounted changeable message sign should flash alternately to read “RIGHT LANE”, “CLOSED AHEAD”. Because of each state’s unique regulations, before ever planning to use the message board function of the full matrix message board, you should consult your state’s legislation. 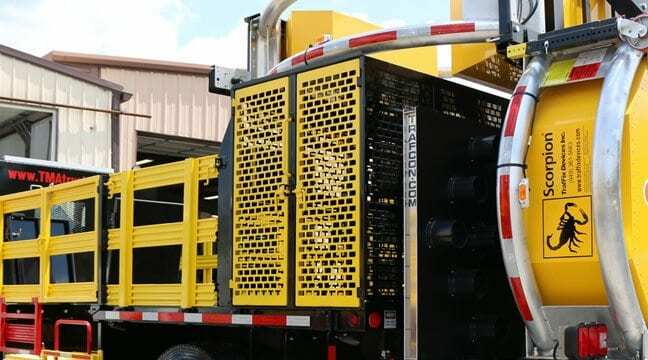 The fourth safety feature which is beneficial to have on your TMA truck is a sign cage. Not only is it a secure location to store signs and other equipment, but it also is a security feature in the event of a collision. In a crash, signs and other equipment on the bed of your truck would become dangerous projectiles. These items would then not only be a risk to your work crew but also to other drivers in the area. When they are in the sign cage however, a collision with the attenuator would not make the necessary tools for your operations dangerous projectiles. The doors of the sign cage should be able to be locked. This is another safety tool to prevent signs in the cage being projected from the truck in the event of a crash. The cage should be big enough to fit a standard highway construction sign. For reference, the standard size of a highway construction sign is 4 feet by 8 feet. There should have doors on each side of the sign cage. This allows for signs in the cage to be removed or stored from either side of the vehicle, allowing for safe access. Adding a camera system with DVR recording capability to the trucks in your fleet has two significant benefits to your operations, including: increasing your work crew’s safety and decreasing your company’s liability. Working in unison, the 4 cameras mounted in and around your truck are constantly recording your work zones, while the DVR system saves the footage. How does that benefit your company, though? A crash happened in a work zone every 5.4 minutes in the United States in 2015, according to the Federal Highway Administration. It has become increasingly likely that a crash will happen in your work zones. When that crash does happen though, it is important that all the details of the incident are captured. Watch actual crashes recorded from a camera system with DVR recording capability on trucks around the country. With the camera system recording in 1080p, the smallest details can be captured, such as the vehicles and their license plates, in the recorded footage. This helps to establish liability protection for your company, as you can show exactly what happen in the time leading up to and following the crash. An added benefit to having the recording technology on your trucks is that it can be used for internal review and training. After an operation has been completed, you can review the footage captured by the system, allow you to ensure that your work crew was operating in the safest and most efficient manner. As an upgrade to the mobile safety system, the fleet management software allows a fleet manager to not only have historical records for each of their trucks, but also gives them the capability for live insights! In real time, a user can see footage from all cameras on each of the trucks that is connected to the software along with data, such as speed, location, status, and geo-fence area tracking. In addition, a fleet manager can set up alerts that trigger with events, including: high speed, high acceleration, loss of video, camera being covered, or if the truck left the pre-set geo-fence. This software also gives the user the ability to see when the truck was online historically and pull data and video from dates in the past. For companies with sizeable fleets, adding the fleet management software to the trucks in your fleet can be the catalyst to safer operations! To learn more about the systems capabilities, read more here. If your company is frequently tasked with lane closure operations, requiring the deployment and retrieval of cones, the Roadrunner is an essential safety tool for your organization. For those who do not know, the Roadrunner is an automatic cone placement and retrieval system that attaches directly to the deck of your truck. In mobile operations, all that is required for the Roadrunner to operate is someone on the deck of the truck to place or retrieve cones in the system. Ultimately, the Roadrunner removes workers from direct exposure to traffic and other work zone hazards by “taking boots off the ground”. See the Roadrunner in action by watching the video above and learn more about it by reading more here! Perhaps the best truck safety feature that you can add to your TMA truck is autonomous technology. The most obvious safety benefit the recently launched autonomous TMA truck presents is that it removes the driver from a truck designed to be hit. In recent years, drivers of TMA trucks have been seriously injured or even killed when their truck was struck during an operation. Removing the driver of the TMA truck with autonomous technology also has other safety benefits. One major thing it does is that it removes the human instinct of self-preservation. The natural human reaction to an errant car or truck barreling down the road towards your TMA truck would be to steer out of the way. Autonomous technology prevents this reaction and allows the truck to do its job in protecting the work crew. Another safety benefit of autonomous technology is significantly reducing the following distance deviation. By allowing too much or too little roll ahead distance, the truck is not as effective in protecting the work crew. Humans are not nearly as effective at remaining the same distance behind a leader truck as the autonomous technology is at doing it. This video showcases the launch of an autonomous TMA truck in a live operation on August 18th, 2017 in Colorado. To learn more about the benefits of autonomous TMA trucks, click here to read more! 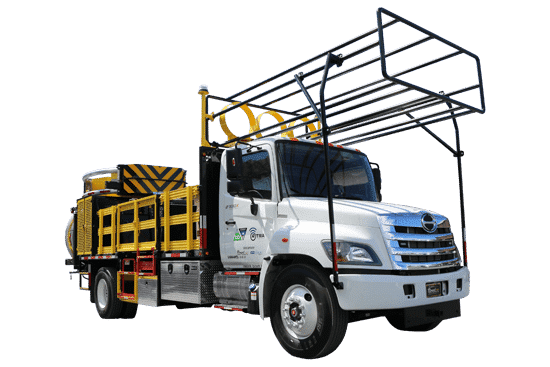 Whether you are looking to purchase more trucks for your fleet or if you are just evaluating your current TMA trucks, there are several safety features that you should be looking to add that will make your work zones safer and your operations run smoother! Could not agree with you more about safety first, trucks helps us on a bigger scale more than we could ever imagine! We completely agree! Safety is always a priority! These safety features for truck must be known to all the truck handlers. This is a helpful post and a great guide for auto detailing Hamilton MT crew. Thanks for your comment! We’re glad this could be such a helpful source of information for you.